79 Brused with a fall Take stone pitch and beate it and drink it with white wine then melt parmacitie and anoint the place where the bruse is. 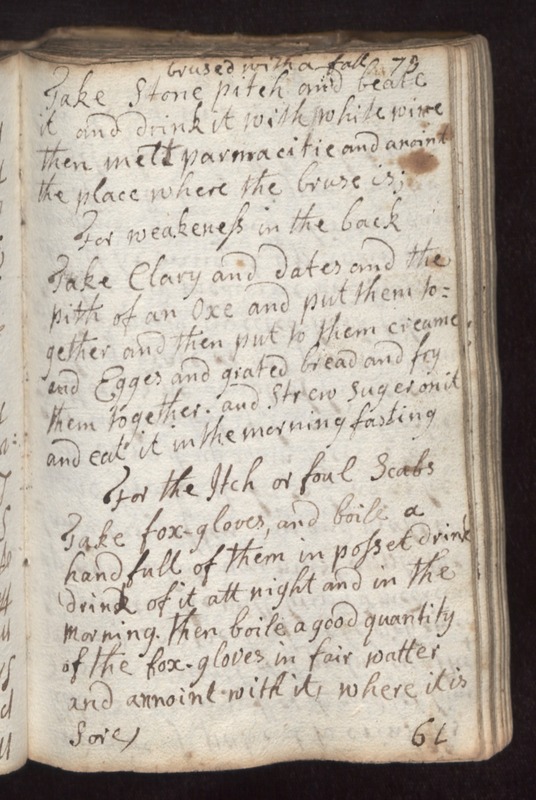 For weakeness in the back Take Clary and dates and the pith of an oxe and put them together and then put to them creame and egges and grated bread and fry them together and strew suger on it and eat it in the morning fasting. For the Itch or Foul Scabs. Take fox-gloves and boile a handfull of them in posset drink drink of it all night and in the morning. Then boile a good quantity of the fox-gloves in fair watter and annoint with it, where it is sore.